Index increased by 3% in 2015, up from 2.3% a year earlier. Forty-three of 55 countries tracked recorded positive annual price growth in 2015. Turkey leads the rankings with prices ending the year 18% higher. Belgium and New Zealand are the least affordable countries when house prices are compared to incomes. Ukraine and Greece were the weakest housing markets in 2015, recording prices falls of 12% and 5% respectively. London, UK – The Knight Frank Global House Price Index* increased by 3% in 2015, up from 2.3% in 2014. Concerns over the global economy in 2015 failed to dent buyer confidence; instead the lingering low interest rate environment influenced sentiment. Turkey leads the rankings with prices rising 18% during 2015. Increasingly viewed as a safe haven for Middle Eastern investors, Turkey is bridging East and West whilst also seeing strong population growth. Data from China’s National Bureau of Statistics shows house prices rose marginally in 2015 (0.4%) having reached their peak in the first quarter of 2014. Cities such as Shenzhen and Shanghai continue to outperform the national average due in part to favourable government policies and strong demand in first-tier cities. Australasia was the strongest-performing world region in 2015, buoyed by the strong performance of New Zealand and Australia, both of which saw annual price growth in excess of 10%. Housing affordability, or the lack of it, is rising up policymakers’ agendas worldwide. 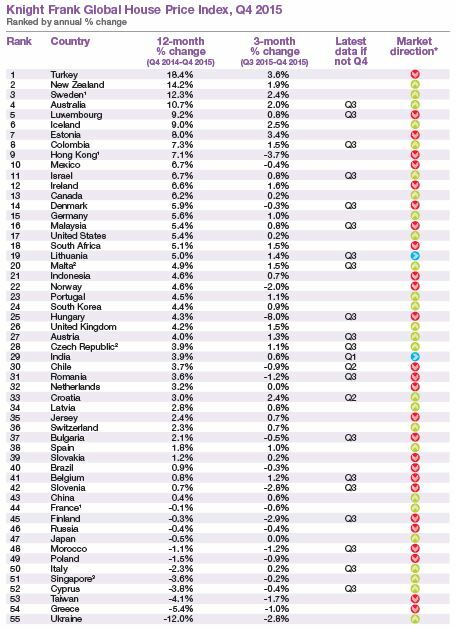 According to the latest data from the OECD, which measures house prices against incomes for 24 of its 34 members, Belgium and New Zealand are currently the world’s least affordable markets, whilst home ownership is most accessible in South Korea and Japan. Knight Frank LLP is the leading independent global property consultancy. Headquartered in London, Knight Frank, together with its US alliance partner, Newmark Grubb Knight Frank, operate from 417 offices, in 58 countries, across six continents and has over 13,000 employees. The Group advises clients ranging from individual owners and buyers to major developers, investors and corporate tenants. For further information about the Company, please visit knightfrank.com.